This is a Purdy paint brush I’ve been using for ten years. The 2 1/2″ angled design is perfect for painting straight sharp lines as well as for general usage on medium size surfaces. Purdy is the choice of all professional painters for the quality of their paint brushes — the bristles do not fray, bend, or fall out and the brush keeps its shape. I prefer their nylon bristle brushes which can be used with any paints, although the china bristle brushes perform beautifully with oil paints. In my carpentry work I often paint my own finished products, and I always paint the cut ends and edges of exterior boards to prevent them from rotting. A good brush can last a long time if you take care of it. The immediate concern is to not allow paint to dry on the brush. On the job, you can delay that by wrapping the paint-soaked brush in plastic or aluminum foil when you’re not using it. Try to remember to clean the brush soon after you’re through with it. For the first step, latex cleans with water; oil base and urethane cleans with mineral spirits, turpentine etc. Shellac (such as BIN primer) cleans with denatured alcohol. Use a wire brush with down strokes to remove hardened particles. Brushes hold their tips when stored in aluminum foil. I clean brushes with the appropriate solvent in a large yogurt container. The old paint sediment will settle to the bottom. After several days carefully pour the clear thinner from the top into another container for reuse. Dispose of the paint sediment in the original container. My final step is to clean the brush again with hot soapy water until the brush is clean and all residue of the paint and solvent is gone. 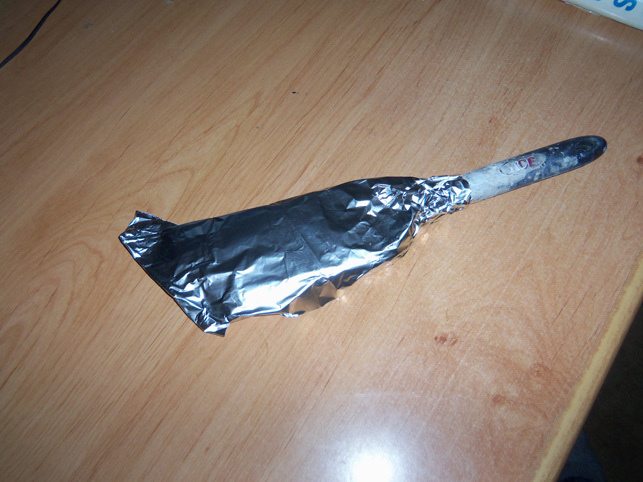 I then wrap the brush in a fresh piece of aluminum foil to keep it moist and to retain a perfect point. Purdy brushes have always been the professional’s choice, long-lasting when properly cared for. Cheap dollar-store brushes should be considered disposable at best, used for contact cement or difficult to clean paints.